T.Hunter & Son are a small family run business with over 25 years experience in the coal industry. 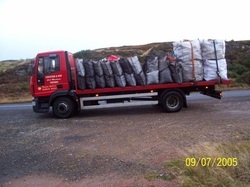 We supply all kinds of coal and smokeless anthracite and ovoid’s, firewood and kindling delivered to your door or cash and carry from our yard in Thurso. We have pre packs in 25kg so they can go in your car boot and net bags of logs so you need never run short. Hunters Coal started selling firewood back in 2007 gradually building up to the operation we have in place today. We buy in all our timber locally through either the forestry commission or any harvesters although we try to get as much blown timber as possible and have at least 200 tons of trees in stock drying out. Each summer we have a dedicated team cutting as much trees as we can store under cover to get it as dry as possible 19 - 21% moisture. Our trees are mainly spruce or lodge pole pine that we currently sell. To find out which solid fuel best suits your needs please call our office in Thurso on 01847 892773 where our friendly staff will advise you on the best fuel for your fire.